The IDEX Legal Awards celebrates the achievements of in-house lawyers which is led by an excellent jury line-up including some of India and the world's most respected in-house authorities. 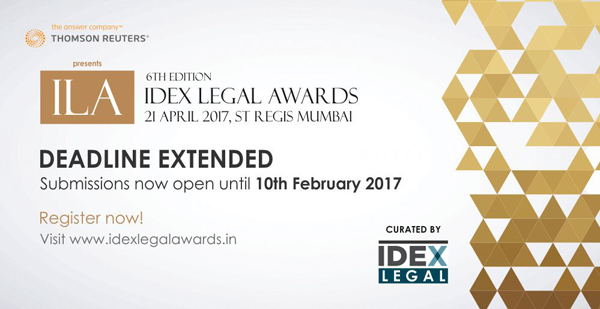 The IDEX Legal Awards are focused on being, at the very least, on par with the leading global legal awards whether that be IFLR, Chambers or The Lawyer Awards, and our vision is that the IDEX Legal Awards become the de facto sign of recognition and achievement for the legal fraternity in India and beyond. The awards are unique in clearly identifying those in-house counsel, law firms, and consultants both teams and individuals, who excel in their specific roles. Our primary aim is to be credible and impartial, facilitators, recognizing lawyers and consultants for their demonstrable achievements across the full spectrum of their responsibility. Start-Up Law Firm of the Year (1st October, 2013 - 30th September, 2016).